As the UK agents & stockists for Jokey Plastik GmbH for over 40 years, Taylor Davis Ltd are well equipped to offer a comprehensive range of polypropylene tubs & buckets. Extensive stock holding in 3 depots; In Wiltshire (Head Office), Warwickshire and West Yorkshire. The famous JET (Jokey Euro Tainer) range of tamper evident polypropylene containers feature sizes from 120 ml up to 30 litres, offering a variety of packaging solutions to our customers. All items are manufactured throughout from food grade polymer, to ISO, HACCP, and BRC standard. All items can be decorated to customers’ specific designs on either Digital printing, or the very latest In-Mould Labelling. Pigmentation is available across the whole range, including crystal clear. U. N. approved & heavyweight buckets are available from 5 litre to 30 litre. Specialized lid fittings are available including pour spouts and wet wipe dispensers. 2 component buckets available in a variety of sizes. As of the 21st February 2012 Taylor Davis became sole distributors of Jokey Plastik products. 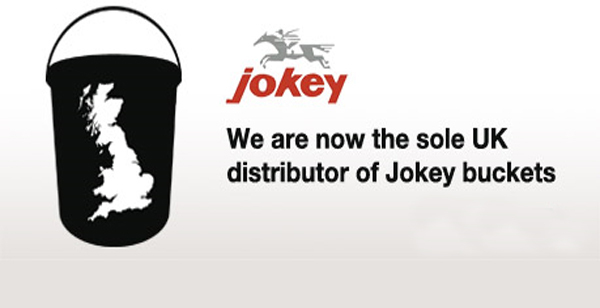 A warm thank you to all our existing customers who have chosen to order Jokey Plastik from us over the years, with your support we are delighted to announce that we are now the sole distributor of Jokey buckets throughout the UK. This announcement builds on our successful 40 year relationship with Jokey Plastik GmBH. We have decided together that the best way to service UK based customers is to strengthen our partnership and set up this sole distribution partnership. If you are already a customer of ours then business will be as usual. If however, you have previously been ordering your Jokey buckets from another supplier and would like to consider ordering through us, then please give our friendly staff a call on 01373 864 324 to discuss price and delivery. 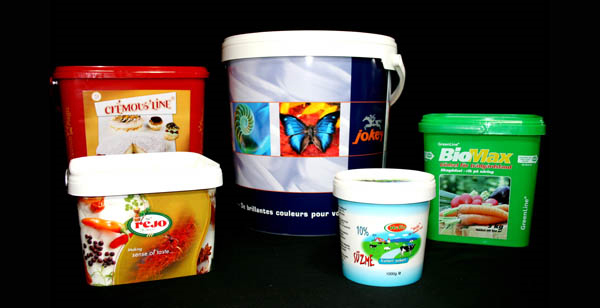 Jokey Plastik continue to push the boundaries of packaging design and innovation, and are now among the market leaders in providing high quality in-mould label (IML) reproduction on their containers. Having only introduced this revolutionary process into their range in 1999, Jokey have seen a truly remarkable growth in the sales of In-Mould Labelled items over the past few years. Indeed the volumes have now superseded those of standard offset printed items. Jokey are unique among their peers in being able to offer this technology in the widest range of available sizes, from 120ml up to 21 litre buckets – both on the container itself AND its lid! It’s not only the labels that are flexible either, despite this process being most aligned to mass volume production, Jokey can also offer smaller production runs than many of their rivals, enabling the advantages offered by IML to all. Multi cavity IML production of small tubs (e.g. 1 litre and below) gives Jokey the edge in terms of being able to meet their customers’ needs, especially in the increasingly demanding retail sector. IML is a rapid, high volume, single manufacturing process, as far as Jokey are concerned. No other producer of injection moulded packaging can see their printed container, complete with handle, produced in one single moment. Jokey’s blue chip customers have seen their sales soar thanks to the IML quality. In-Mould Labelling is available on round, rectangular and oval specifications. With the recent addition of digital printing this now gives the customer the option of a very high quality finish with a minimum run of just 2 pallets. This option available from 3 litre buckets up to 21 litre sizes.